Raspberry Pi Model B+, ARM1176JZF-S Running at 700MHz, 512MB RAM. Everything you need to build basic EasyIoT server on Raspberry Pi platform. To control EasyIoT server by SMS message. 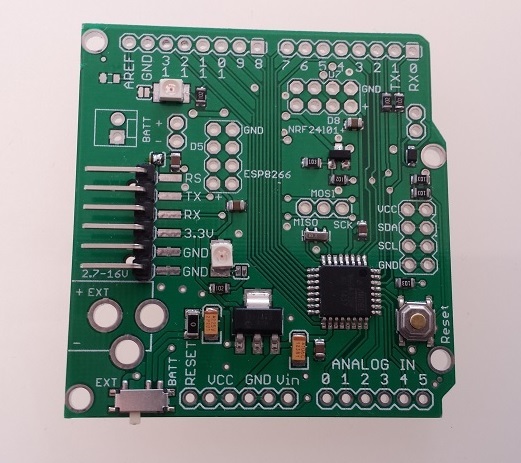 To build custom sensors and NRF24L01 transmitter/receiver on Raspberry Pi. For Raspberry Pi or sensor modules, cheap and easy power solution. No need for network cables on EasyIoT server. Use WiFI USB dongle. Best price if you need Meaga 2560, TFT screen and shiels. Excellent kit for Arduino beginners. The BMP180 is the new digital barometric pressure sensor of Bosch Sensortec, with a very high performance. Be able to control various appliances, and other equipments with large current. 2 channel. Be able to control various appliances, and other equipments with large current. 4 channel. Be able to control various appliances, and other equipments with large current. 8 channel. The nRF24L01 is a highly integrated, ultra low power (ULP) 2Mbps RF transceiver IC for the 2.4GHz ISM (Industrial, Scientific and Medical) band. ESP8266 serial WIFI wireless transceiver module 3DBI gain antenna.